Welcome to Adams Grove…where the pies are delicious but the lies are to die for. America’s beloved country superstar Cody Tuggle never expected to be one of America’s most wanted. At least that’s how he feels since he’s been accused of murdering his scheming agent. Desperate to prove he’s innocent, he turns to his only alibi, award-winning photographer Kasey Phillips, who recently toured with him and his band. After an exciting life on the road, Kasey has settled down in small-town Adams Grove with her five-year-old son. Unexpectedly reunited with Cody, she finds herself open to love again. But just when she’s ready to fall, everything she ever believed about him is called in to question. Cody has waited a long time for genuine love, and he can’t let this chance with Kasey slip away. But as the evidence stacks up, the accusations against him put a damper on the sparks flying between them. Can he convince Kasey he’s innocent, and will she clear his name in time? Or will their dreams of the future be the victim of a deadly lie? 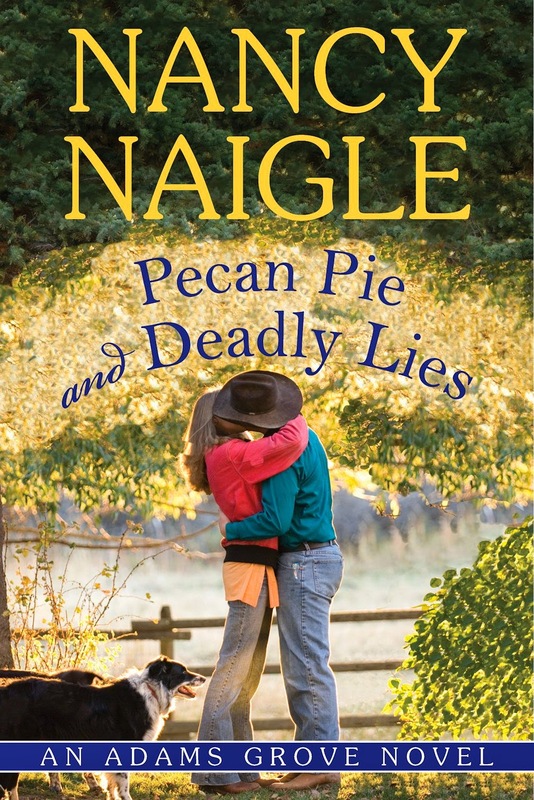 Pecan Pie and Deadly Lies is a sweet, down-home story of love overcoming all obstacles—from the crossroads of small town and suspense. A convoy of antique tractors sputtered down Main Street in Adams Grove, a tradition for the last day of the kids’ summer vacation. Kasey Phillips focused her camera on the bright green equipment and took a picture, then lifted her hair from her neck. The air was sticky, not uncommon for late August in southern Virginia, but she didn’t mind standing out here in the heat in exchange for the joy she saw on Jake’s face. Her son bounced at her side like a jack-in-the-box. She captured another shot of the parents and children who lined the parade route catching up on the local goings-on between squeals of excitement. Kasey stooped next to him and followed his line of sight. She doubted anyone else would notice the light that seemed to shine behind those eyes when he spoke of Nick, but she saw it and it tore at her heart every time. The old putt-putt tractor chugging down the street was just like the John Deere Model B that Nick had restored. “You’re right,” she said and gave him a squeeze. Jake had been only two years old that winter—that kid didn’t forget a thing. Nick was still so alive in Jake’s mind. She wished her memories were as vivid, but she felt Nick’s absence every single day. A big void that nothing seemed to fill. Kasey glanced down at Jake. His face beamed as the homemade floats celebrating the end of summer break passed by. In Jake’s case, that meant his first day of kindergarten would be Monday and he hadn’t stopped talking about it since she took him to register. “I’m not as excited as he is.” Putting Jake’s abduction behind her hadn’t been easy. Even leaving him in Sunday school class had been so hard that she nearly always slipped back down the hall to peek in the window and check on him. Even now, over a year later, the fear that something might happen to Jake again ran strong. Kasey reached for Jake’s tiny hand. “It’ll have to be.” Kasey wrestled with the worry and tried to garner strength from the smiling locals who filled the sidewalk two and three deep as far as she could see. She was thankful she’d landed here in this little town—a place she’d never even heard of a year and a half ago. Nick’s death had left her hurt and empty, but this town had tugged her into a hug that helped her get through the tragedy. She was finally finding a new routine, a new home—finally in focus. Jake tipped his face to hers and grinned. No matter how bad things had seemed, Jake was the light that led her through every day. You’re the best thing I ever did in my life, sweet boy. Nick would have loved this parade. For a moment she drifted away in the memory of his warm touch. How it would feel with him standing here next to her. One arm around her and hugging her close. Who am I kidding? He wouldn’t have been by my side. He’d have been in the parade. That made her smile, and her heart lift. You’ll always fill my heart, Nick. Jake let go of her and threw his hands in the air, then darted into a group of bobbing school-aged kids, nearly disappearing from her view. Kasey’s heart lurched. She pushed away the desperate feeling that invaded her sensibilities more often than she liked to admit. Fighting the urge, she folded her arms to keep herself from grabbing Jake and holding him close. Although Riley didn’t say anything, Kasey felt her friend watching her reaction. I know you’re worried about me. I wish I could tell you I’m okay. High school football players in full gear walked the edge of the crowd handing out candy. Jake swerved to the outside of the clump of kids at the sidewalk’s edge, then ran back toward her with his treat. He opened his hand to show her the surprise. “Our favorite,” she said as she eyed the red licorice candy. “It’s like he knew!” He dropped the bounty into the plastic Piggly Wiggly bag she held for him. “This is the best parade ever!” He turned toward Riley. “I can get you one too!” He darted into the crowd, then came back to deposit something else in the bag. The Adams Grove Fire Department truck rumbled by with the volunteers hanging precariously from it. Right behind that, Scott Calvin cruised by in his sheriff’s car with his blue lights flashing and a whoop of the siren. Cowboy's Pride by Morgan Blaze - $0.99! Home For Christmas by Melissa McClone - FREEBIE! Beauty Bites by Mary Hughes - $0.99!